When it comes to her fashion choices, I can't say that Sofia Boutella has always made the best one. She attended the Panthere de Cartier Watch collection launch party on Friday(May 5th) at Milk Studios in LA. 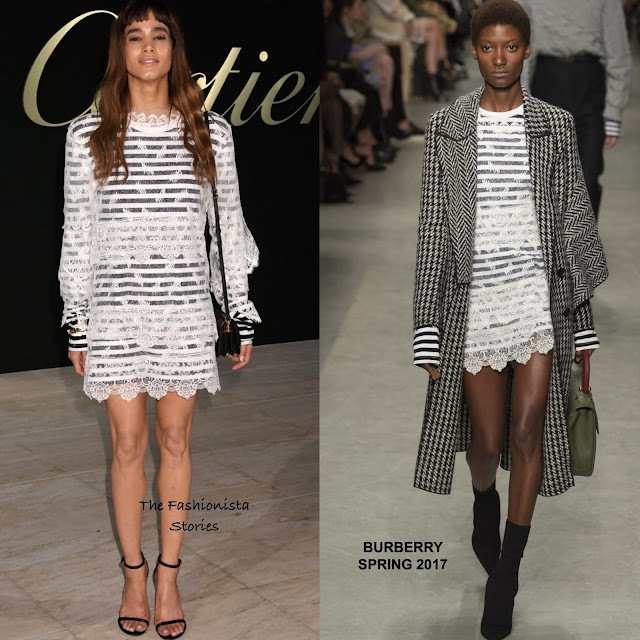 For her appearance, she wore a BURBERRY SPRING 2017 long sleeve layered mini dress which featured a white lace overlay and a contrasting black & white stripe underlay. With the exception of the sleeves, I actually like this dress. However I wish the hair was completely off-the-shoulder and her baby bangs pulled back or swept to the side. A black shoulder bag & sandals finished up her look. Are you feeling Sofia's look?